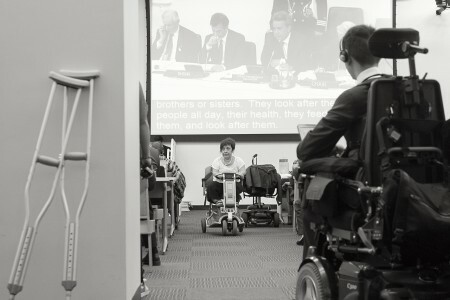 The Convention on the Rights of Persons with Disabilities (CRPD) is a international human rights treaty intended to promote and protect the rights and dignity of persons with disabilities. The text was adopted by the United Nations General Assembly on 13 December 2006 and has 107 parties as of December 2011. To promote the training of professionals and staff working with persons with disabilities in the rights recognized in this Convention so as to better provide the assistance and services guaranteed by those rights. Promote the design, development, production and distribution of accessible information and communications technologies and systems at an early stage, so that these technologies and systems become accessible at minimum cost. Recognizing and promoting the use of sign languages. Effective individualized support measures are provided in environments that maximize academic and social development, consistent with the goal of full inclusion. Ensuring that the education of persons, and in particular children, who are blind, deaf or deafblind, is delivered in the most appropriate languages and modes and means of communication for the individual, and in environments which maximize academic and social development. To ensure that persons with disabilities have access to services from those involved in the organization of recreational, tourism, leisure and sporting activities. 1. There shall be established a Committee on the Rights of Persons with Disabilities (hereafter referred to as “the Committee”), which shall carry out the functions hereinafter provided. 12. With the approval of the General Assembly, the members of the Committee established under the present Convention shall receive emoluments from United Nations resources on such terms and conditions as the Assembly may decide, having regard to the importance of the Committee’s responsibilities. 5. The Committee shall transmit, as it may consider appropriate, to the specialized agencies, funds and programmes of the United Nations, and other competent bodies, reports from States Parties in order to address a request or indication of a need for technical advice or assistance contained therein, along with the Committee’s observations and recommendations, if any, on these requests or indications. 1. “Regional integration organization” shall mean an organization constituted by sovereign States of a given region, to which its member States have transferred competence in respect of matters governed by this Convention. Such organizations shall declare, in their instruments of formal confirmation or accession, the extent of their competence with respect to matters governed by this Convention. Subsequently, they shall inform the depositary of any substantial modification in the extent of their competence. 2. References to “States Parties” in the present Convention shall apply to such organizations within the limits of their competence.